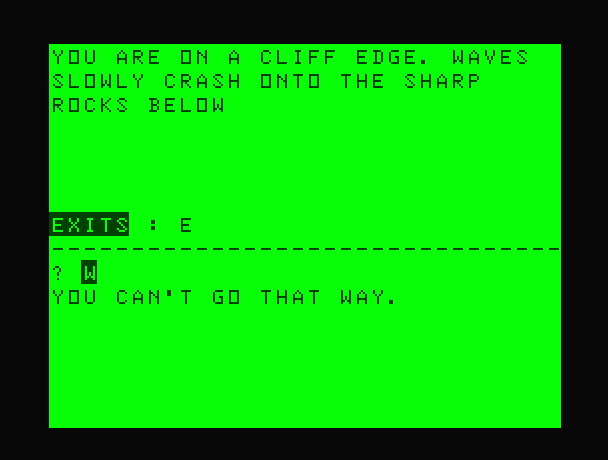 Writing A Text Adventure: Day Four - Oh No You Don't! The next logical step in the game is to allow the N,S,E and W commands to work. It was great to be able to walk around the game world and wander off the 'edge' of the map (?BS ERROR) so I quickly added a check for valid exits. Next was a little tidy up of the display and remove the CLS when the location updates. Much smoother! Tomorrow is definitely more map work. Items the day after all being well.